This recipe is from BOM BOM Brands. I've adapted it ever so slightly. Serves: It's up to you! Put the BOM BOM, vodka, pumpkin, and ice in a martini shaker or mason jar. Cover and SHAKE YOUR BOM BOM!! Strain and pour into martini glasses (optionally rimmed with crushed cookies). Garnish with a sprinkle of cinnamon or a cinnamon stick. 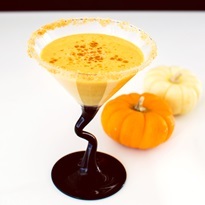 Creamy Pumpkin Pie Cocktail Option - Combine ¼ cup + 2 tablespoons creamy liqueur, 2 tablespoons pumpkin puree (pumpkin pie filling for sweeter), and up to ⅛ teaspoon ground cinnamon (to taste). Omit the vodka. This makes 1 large drink.